Shanling CD-T300 review | What Hi-Fi? These pages are far more than mere havens for products that cost a hefty wedge. More often than not, it's also where we find the kit that bucks the trend in terms of design. Regardless of what we think of the styling, we applaud any novel approach in the often predictable world of hi-fi. 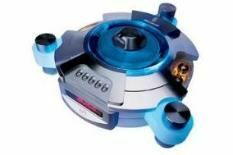 And this CD player is one of the most eye-catching we've seen in a long time, possibly taking design hints from He-Man's shield, or perhaps Thunderbird 5? Either way, it's fair to say that the blue neon light effects, coupled with the red LCD display and orange burn of the valves - more on those in a minute - create a design that divides opinion. The build is good, but not flawless: while the whole aluminium alloy chassis and two supplied remotes feel built to last many lifetimes, there are a few sharp edges that could still do with some light filing - which isn't great on a £4k player. Inside, four EH6922 valves form the output stage. These valves run hot, producing plenty of heat and an orange glow in next to no time. The transport is a Philips item, complete with removable lid, while power comes via a separate supply unit. Elsewhere, there are eight DACs, balanced and phono outputs, and an upsampling mode. Listening to Leftfield's Melt from the stunning Leftism album, the Shanling produces a solid, detailed sound. The midrange is firm without being harsh, while integration of sounds is seamless, with the player producing a coherent blend. Switch to John Williams' Star Wars: Revenge of the Sith soundtrack, and the T300 shows it's plenty capable of delivering gung-ho dynamics without ever losing its poise, even if the soundstage is a little compact. Meanwhile, the hip-hop remixes of Sergio Mendes show the player's low-end agility.